Iced Coffee Recipes, cold coffee, coffee milkshake. Iced coffee recipes are for those who don't want to do without their regular coffee intake on hot days. The hot weather makes you long for a cool drink. You can not do without your caffeine and you don't want to drink that hot coffee in the hot weather. Iced coffee is a perfect answer for you. If you are a regular coffee drinker, you want your hot coffee even in hot weather. Ok drink it. But once in a while have this iced coffee. You are sure to enjoy it. Iced coffee is a good stimulating drink. And it is easy to prepare. You can make it with instant coffee powder or with your regular brewed coffee. Doesn't this coffee with ice cubes make you want to drink it NOW? 2 tsp instant coffee powder. Place the instant coffee powder and sugar in the tall glasses. Add a little warm water (1 tbsp) stir till sugar and coffee powder dissolves. Add cold milk and top with ice cubes as desired. 1 1/2 glasses cold milk or water. Place the coffee brew and sugar in the tall glasses. Add a little warm water. Stir till sugar dissolves. Add cold milk or water. You can also use a scoop of vanilla ice cream instead of or in addition to ice cubes. It makes a wonderful after meal coffee / dessert. You can also serve it as a snack. 3. 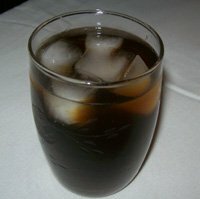 Make iced coffee with coffee cubes. When you have some leftover brew, freeze it in the ice cube tray. You may also make special brew of your choice and once it is at the room temperature, freeze it in ice cube tray. When you want iced coffee, add the coffee cubes, milk(optional) sugar and water to a glass. Add ice cubes and enjoy your cold iced coffee. 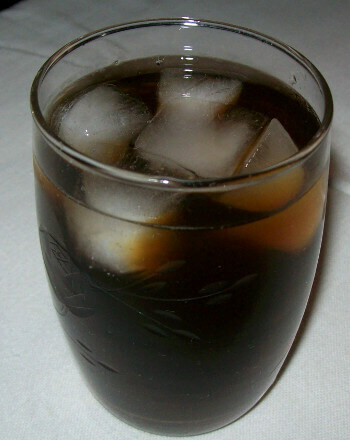 We will be adding more iced coffee recipes.